Weed tech companies have an Apple problem. They face uncertain rules when navigating its App Store policies, and now a petition is circulating asking the iPhone maker to lighten up. These cana-businesses range from digital publications and social apps to investment funds and ad networks, all dedicated to the burgeoning legalized marijuana trade. Many are based in Colorado, where recreational pot is legal, but despite their legitimacy under the law, they're having a hard time getting approval from Apple for their apps. Pot tech entrepreneurs say Apple's restrictions are unpredictable, unfair and threatening the growth of a budding industry. Apple is notoriously arbitrary in choosing the apps that will grace its digital store, and that store controls a major share of the mobile market and can make or break companies. Last year, it banned a game called Weed Firm, which let people virtually grow and sell pot. Now, apps like MassRoots, an Instagram-style social network centered on pot, say they have been banned because Apple doesn't seem to allow services that connect likeminded marijuana lovers. After it was kicked out of the App Store, MassRoots wrote a letter to Apple and began circulating an online petition this month. "We're a social network for cannabis that enables people to talk about the plant in ways most people don't feel comfortable on other social networks," said Isaac Dietrich, CEO of MassRoots. "I don't want grandma to see me taking bong rips on Facebook." MassRoots is allowed in Google Play's Android app market, but Apple is far stricter. The app had been in the Apple App Store for 14 months until November, when it was kicked off on Election Day as some states prepared to vote on marijuana laws, following legalization in Colorado and Washington. "Apple really hurt us and our right to assemble, our right to free speech, and our right to mobilize cannabis consumers like any other constituency," Dietrich said by phone this week. "It's ironic that on the same day Alaska and Oregon voted to legalize marijuana, Apple took the opposite approach." Apple has not responded to Adweek's requests for comment on this issue. 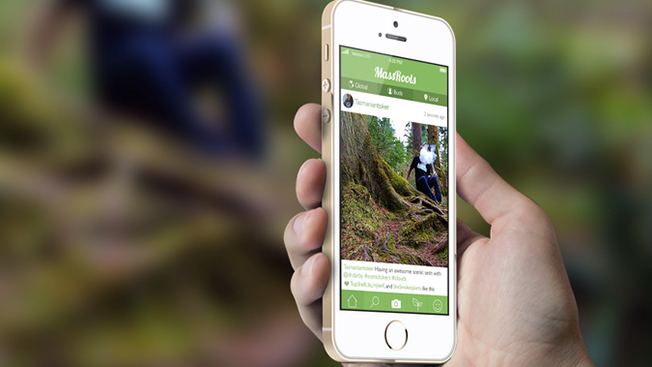 MassRoots is not just a novelty app. Though relatively small with 120,000 downloads before being booted from iPhones, it has legitimate business prospects of raising investment dollars, though it has no revenue yet, Dietrich said. And it's not alone in attracting investors—weed tech businesses garnered more than $100 million in venture capital last year, according to CB Insights. MassRoots has ambitious plans for growth, including the goal of going public, Dietrich said. It's in the process of raising more money from investors, who already gave the company more than $600,000, he said. The sector has attracted big-name investors like Peter Thiel, won the support of celebrities like Snoop Dogg and is bordering on mainstream with apps like Weedmaps gaining traction. In fact, Weedmaps, a Yelp-like service that rates pot dispensaries, was just forced by Apple to change how it promotes recreational pot shops, according to Dietrich. Though Weedmaps would not comment for this article, sources familiar with the app's status said it now can't give specific information to users telling them which marijuana outlets in legal states are either for medical or recreational purchases. Other app developers and aspiring pot tech titans say Apple is schizophrenic in its rules. One app called Whaxy—with plans to serve as an Open Table for pot pickups—just won approval this week, and it was built by a company that already had two other pot programs blocked. One of the banned properties calculated the THC content of certain edibles, and the other, called Nuggle, was going to connect pot smokers like Tinder connects daters. In the case of Nuggle, the social networking component could have been the problem, according to Zachary Marburger, Nuggle founder and CEO of Whaxy. Marburger said Apple is stifling the business of weed. "The ability for us to even be in the App Store, let alone have the features we want and need for our businesses to be successful, is huge," he said. He was surprised Whaxy even got the go-ahead and hopes it lasts, because he fears Apple could randomly penalize the app, which lets users reserve pot pickups at dispensaries. "You can place an order at the dispensary and skip the lines, which are usually out the door," Marburger said. Whaxy had to engineer the app to direct people to its mobile website to complete actions Apple would not allow like finalizing their pot orders, Marburger said. Marburger supports MassRoots' petition to get Apple to change policies. Only thousands have signed so far, but plenty of pot tech firms are on board, including a digital display ad network called Mantis. "We are not asking for Apple to endorse cannabis-related applications or their content," a letter from the pot-powered companies to Apple reads. "We are simply requesting that Apple's customers have the right to download marijuana Apps if they so choose."